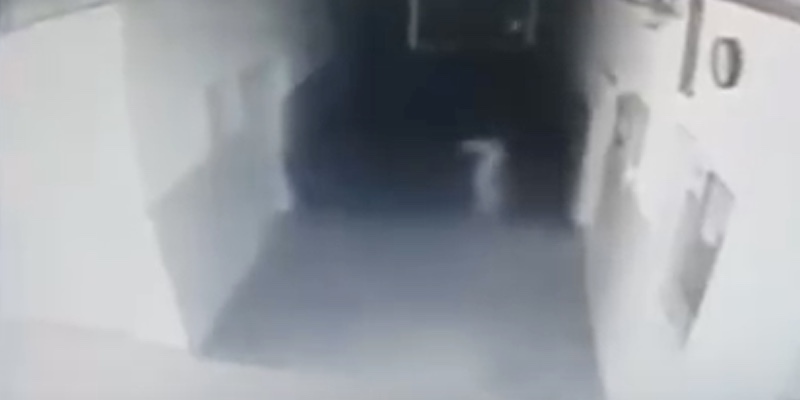 What appears to be a ghost was caught on camera in Trstenik, Serbia, with the incident being caught on surveillance cameras at the police station. Immediately prior to the incident on camera, a woman came into the police station, saying that she had been being followed by what she thought was a ghost. And then, seconds later, the apparition appeared on cameras at the station. She went on to report that the spirit had followed her to the town fair and she said it seemed to be jumping from street light to street light. It probably would have sounded like a crazy story to the police, if they had not seen it on camera themselves. It has long been understood that spirits can manipulate electronic devices, which is why investigators use EVP (Electronic Voice Phenomenon) devices and EMF detectors during investigations. Which is why it’s not that unusual to hear that a spirit “jumped” from light to light. Some people further speculate that not only can spirits manipulate electronics, they can draw energy from them. Is it possible that the spirit used the lights to draw energy in order to keep chasing the woman? Or, did the spirit use the energy to appear on the cameras? Why was the spirit chasing the woman? Is this enough to be considered proof of ghosts? We don’t know the answer to any of these questions. All we know is that there really is something that looks like a spirit on this footage. Maybe after more information from the report comes out, we’ll know more and have more answers to these and more of the questions that this footage brings up. But, in the meantime, it’s a really interesting and intriguing bit of information.